Soak skewers in water 15 minutes. Meanwhile, cut each bacon slice into 4 pieces; cook in 10-inch nonstick skillet over medium heat about 5 minutes or until partially cooked but not crisp. Remove bacon from skillet; drain on paper towels. Cut each chicken breast lengthwise into 5 strips, each about 1/2 inch thick. Cut each strip into 3 pieces. Alternately thread 3 chicken pieces and 2 cooked bacon pieces onto each skewer; place on broiler pan. In small bowl, mix all remaining ingredients until well blended. Pour half of sauce mixture into small serving bowl; set aside until serving time. Brush about half of remaining sauce evenly over kabobs. Broil kabobs 4 to 6 inches from heat 3 to 4 minutes. Brush remaining sauce over kabobs; turn kabobs. Broil 3 to 4 minutes longer or until chicken is no longer pink in center. Serve with reserved sauce. Nutty entertaining schedule? 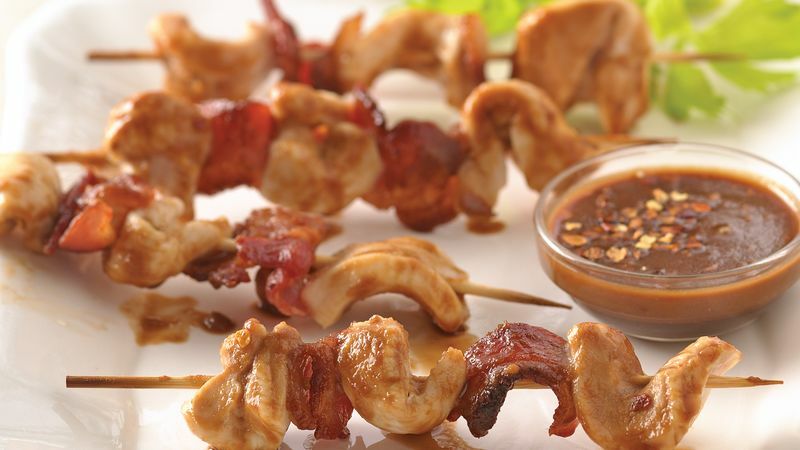 Save time by threading the bamboo skewers with the bacon-topped chicken prior to party time. Cover and refrigerate the skewers for up to 4 hours. Brush the skewers with peanut sauce and broil them just before you're ready to serve.